I saw this Halloween bundt cake on Pinterest and knew I had to try it myself. It’s super easy and has the wow factor I like. The reason this is so simple is that it’s all box cake mix and package frosting: no tricks here. It’s all treat! The first time I made this cake was when we were entertaining my husband’s boss. He was visiting Florida with his wife and two young children and so we had four littles to feed and entertain. It was just a week or so before Halloween and I needed a fun, festive dessert. I also didn’t have a lot of time to make a really fancy dessert. In the past we’ve made Witch hat cupcakes, and candy corn cookies, but I wanted something different. This bundt cake wowed the kids and the parents! This Halloween bundt cake recipe involved two cake mixes (one chocolate, one white), store bought frosting and food coloring. Make one white cake mix as directed on the box mis. Just pick your favorite brand. Separate the white cake mix in half. Color one half orange, the other half purple. Set aside. Pour one 1/3 of the chocolate into a bundt cake pan. Next, pour the orange batter, then the purple batter. Top with 1/3 of the chocolate batter. Bake as directed on the box, usually about 20-25 minutes. Once the cake is done, let cool 5-10 minutes and turn out onto a place. Let cool completely – about 30 minutes. Meanwhile, you can make the frosting by dividing the white frosting into thirds. Color 1/3 purple, 1/3 black, and 1/3 orange. With sweeping motions, drizzle each color over the cake. Overlap colors and have fun with the design! Let the icing set and then serve. The outside of the Halloween bundt cake looks great, but the inside is the real treat. Super cute. Make this quick and easy Halloween bundt cake with store-bought ingredients. Make both boxes of cakes mixes. Divide the white cake mix into two bowls. Color one white mix purple. Color the other white mix orange. Pour 2/3 of the prepared chocolate cake batter into a bowl and add a drop or two of black food coloring. Pour half of the chocolate cake batter into the bundt pan. Pour the purple on top, then the orange, and top it with the remainder of the chocolate. Do not stir these colors. Just simply place one on top of the other. Bake as directed on the box (usually about 20-25 minutes) until a toothpick inserted into the center comes out clean. Let cool 5-10 minutes and turn out onto a plate. Let cool completely, while you make the frosting. Separate the white frosting into three bowls. Add orange, purple, and black coloring into each bowl. With a spoon or whisk get one color of frosting. With back and forth motions drip the frosting on top of the cake. Repeat with each color. Let frosting set and then serve! If you like Halloween desserts, try these cute Halloween cupcakes. Check out my Minecraft cake! Wow, stunning! And we love easy. Werde Teil dieser Sexcommunity und mach die ganze Republik zu Deiner sexuellen Spielwiese! What a fun cake….thanks for sharing. I absolutely love the colors in this cake! Halloween is my most favorite time of the year because of the snacks and the costumes. This recipe seems incredibly easy as well! Great for someone who barely cooks or bakes, haha. That seriously look amazing! And yes, so cool too! this is so cool and fun! I’d love to try it for Halloween! That cake looks awesome! So fun for Halloween. 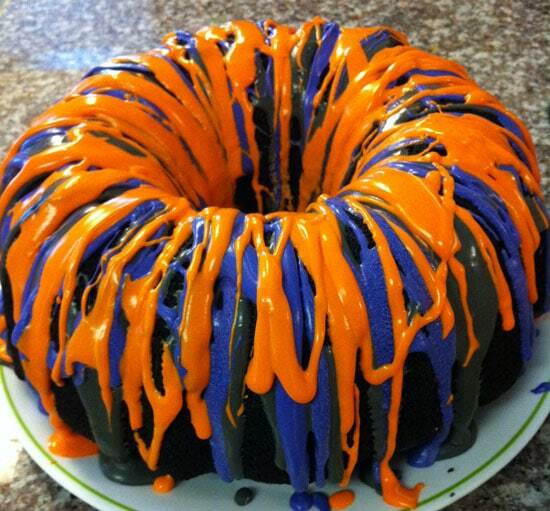 I know this is supposed to be for Halloween but as a Denver Broncos (orange and blue) fan this cake looks perfect for game day!!! How fun!! Can you believe I don’t have a bundt pan??!! I need to get one! This looks awesome! Great Halloween fun! Eine kleine Abkühlung zur heißesten Zeit des Jahres gefällig?